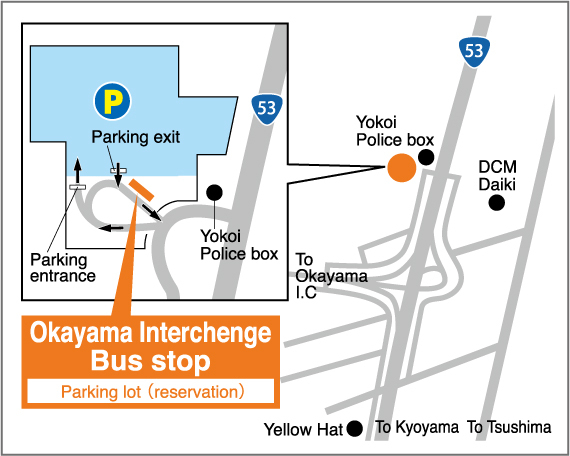 Those who are boarding at the Okayama Interchange will be able to use the express bus Okayama Interchange parking lot. ※There are limitations on the number of cars, and we will only accept in order of arrival. Reservations for consecutive days are 7 days in Izumo line, 14 days in Kansai International Airport line, and 10 days for all the other line. Please note that we do not accept reservations that exceed those amount of days. Free for the first 5 days. 500 yen for each day after 6 days. When parking for 7 days, it will be an additional charge of 1000 yen (500 yen × 2 days). The crew member will provide you with a free parking service ticket for 5 days inside the returning bus . Please request for the ticket. Free for the first 10 days. 500 yen for each day after 11 days. The crew member will provide you with a free parking service ticket for 10 days inside the retuning bus. Please request for the ticket. Free for the first hour. 3000 yen a day will be charged as soon as it passes one hour. The parking lots are controlled under reservations. Please make a request during the seat reservation process. However, only in the case were you are boarding at Okayama Interchange, is when you can make a reservation for the parking lot. No reservations are necessary for pick up customers. From Okayama Interchange to various places (One way) → Reservations are accepted. From Okayama Interchange to various places (Round trip) → Reservations are accepted. From any place other than Okayama Interchange to various places (One way) → Reservations are not accepted. From various places to Okayama Interchange (One way) → Reservation are not accepted. For parking lot reservations, please submit during the express bus reservation process. Please wait at the waiting area instead of your car near departure time. Reservation for the private parking lot of Okayama Interchange can be made during the process of making a reservation for your ticket at the Okayama station west entrance bus center, at the counters of each Ryobi bus tourism center, express bus reservation center (phone), and at the internet/mobile website. (No reservations are accepted for only the parking lot). Those who are boarding at the Tsudaka will be able to use the express bus Tsudaka parking lot. Reservations for consecutive days are 10 days. Please note that we do not accept reservations that exceed those amount of days. The parking lots are controlled under reservations. Please make a request during the seat reservation process. However, only in the case were you are boarding at Tsudaka, is when you can make a reservation for the parking lot. From Tsudaka to various places (One way) → Reservations are accepted. From Tsudaka to various places (Round trip) → Reservations are accepted. From any place other than Tsudaka to various places (One way) → Reservations are not accepted. From various places to Tsudaka (One way) → Reservation are not accepted. 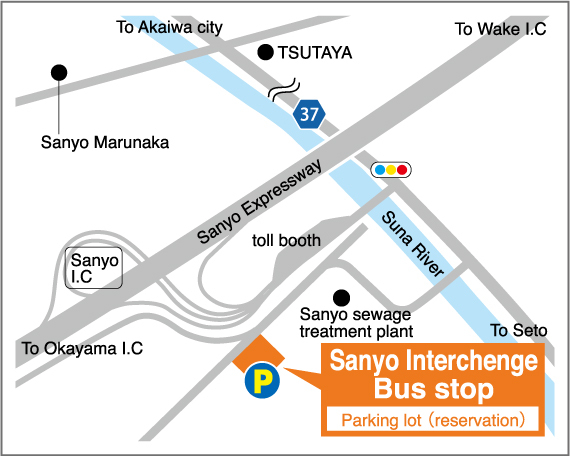 Those who are boarding at the Sanyo Interchange will be able to use the express bus Sanyo Interchange parking lot. Reservations for consecutive days are 10 days, and 14 days in Kansai International Airport line. Please note that we do not accept reservations that exceed those amount of days. The parking lots are controlled under reservations. Please make a request during the seat reservation process. However, only in the case were you are boarding at Sanyo Interchange, is when you can make a reservation for the parking lot. From Sanyo Interchange to various places (One way) → Reservations are accepted. From Sanyo Interchange to various places (Round trip) → Reservations are accepted. From any place other than Sanyo Interchange to various places (One way) → Reservations are not accepted. From various places to Sanyo Interchange (One way) → Reservation are not accepted. 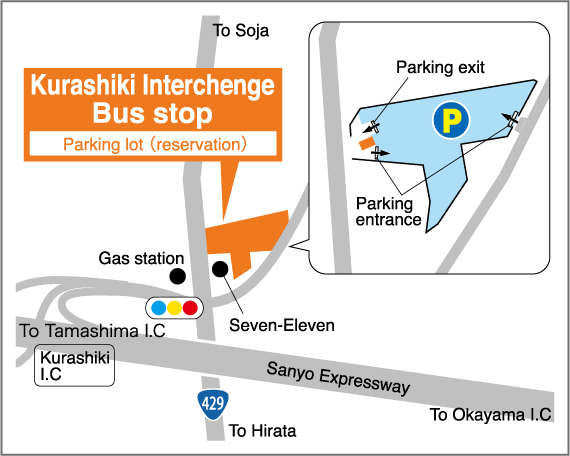 Reservation for the private parking lot of Sanyo Interchange can be made during the process of making a reservation for your ticket at the Okayama station west entrance bus center, at the counters of each Ryobi bus tourism center, express bus reservation center (phone), and at the internet/mobile website. (No reservations are accepted for only the parking lot). Those who are boarding at the Kurashiki Interchange will be able to use the express bus Kurashiki Interchange parking lot. 【Example】When parking for 7 days, it will be an additional charge of 1000 yen (500 yen × 2 days). The parking lots are controlled under reservations. Please make a request during the seat reservation process. However, only in the case were you are boarding at Kurashiki Interchange, is when you can make a reservation for the parking lot. From Kurashiki Interchange to various places (One way) → Reservations are accepted. From Kurashiki Interchange to various places (Round trip) → Reservations are accepted. From any place other than Kurashiki Interchange to various places (One way) → Reservations are not accepted. From various places to Kurashiki Interchange (One way) → Reservation are not accepted. Reservation for the private parking lot of Kurashiki Interchange can be made during the process of making a reservation for your ticket at the Okayama station west entrance bus center, at the counters of each Ryobi bus tourism center, express bus reservation center (phone), and at the internet/mobile website. (No reservations are accepted for only the parking lot). 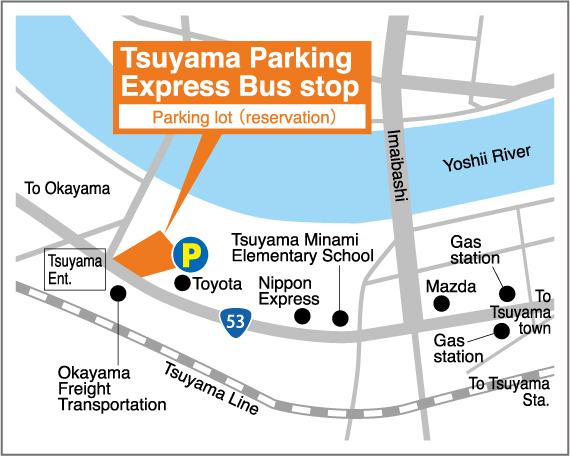 Those who are boarding at the Tsuyama will be able to use the express bus Tsuyama parking lot. The parking lots are controlled under reservations. Please make a request during the seat reservation process. However, only in the case were you are boarding at Tsuyama, is when you can make a reservation for the parking lot. From Tsuyama to various places (One way) → Reservations are accepted. From Tsuyama to various places (Round trip) → Reservations are accepted. From any place other than Tsuyama to various places (One way) → Reservations are not accepted. From various places to Tsuyama (One way) → Reservation are not accepted. 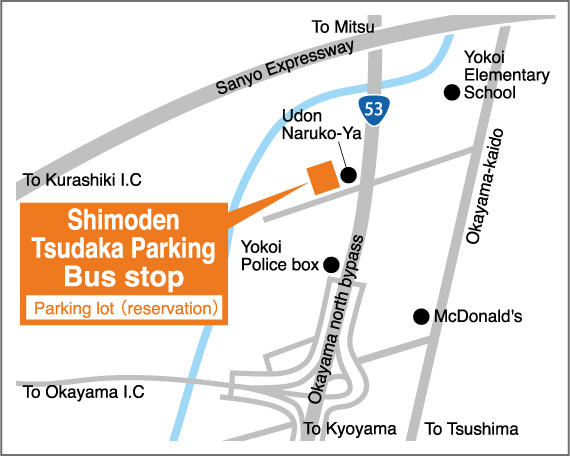 Reservation for the private parking lot of Tsuyama can be made during the process of making a reservation for your ticket at the Okayama station west entrance bus center, at the counters of each Ryobi bus tourism center, express bus reservation center (phone), and at the internet/mobile website. (No reservations are accepted for only the parking lot).